[27/09/2016]. 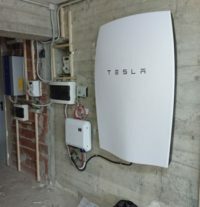 A brand-new Tesla Powerwall storage system has been installed as a retrofit of an exhisting 5,8 kWp residential solar array in Northern Italy. Before the installation the self-consumption rate was about 30% – quite the norm for residential PV plants. The remaining energy produced by the PV is fed into into the grid and cashed back at less then half of the purchase tariff (net-metering program). The estimated self-consumption rate assumed in our proposal was 65%. The attended increase in the self-consumption rate was supposed to decrease the energy bill by almost 2/3. The break even point of the investment is espected in less than 10 years – thanks to the tax-break provided for by the Italian regulation for energy-saving equipment. 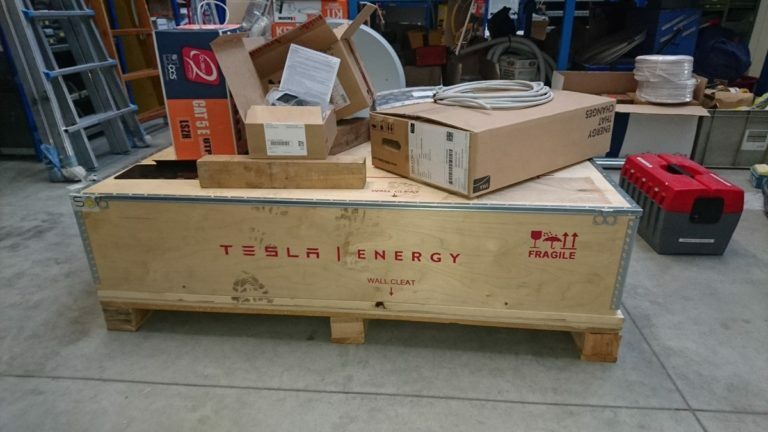 The Powerwall is delivered in a sound box equipped with a mounting frame and the back steel plate that bears the 90 kg weight of the battery. 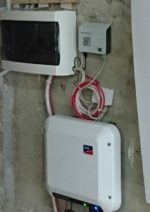 Mounting the Powerwall requires no time thanks to the pre-cabled wirings. The battery is fixed in positions with lateral screws to avoid any movement. The battery start-up is immediate as soon as the lower cover is fixed and you hear a “click” – the cover pushes onto two tiny activation buttons (which they could made more visible actually). A bit more hassling is the data connections. In our case we had to place a LAN witch to feed the two patch wires coming out of the two E-meters into the Home Manager Box (the box has just one LAN port). The data connection supplied by SMA includes RS485 wires to be connected to the Sunny Home Manager – a more fussy solution. We believe the installation would be clean if the Sunny Home Manager was fitted with two LAN ports. The data-flow from the SBS starts immediately after the internet connection is activated via wi-fi or LAN. The battery had a 30% charge level as delivered by the factory. The solar array charges the battery as soon as there is enough energy left after having supplied the house loads. The charging priority is given to the loads, then to the battery and anything left is fed into the grid. Bary noticeable is the noise level – quite a buzz – like a low-powered inverter. The Powerwall has to be registered into the Tesla Energy portal to benefit for the ten-year guarantee [pdf]. the share of self-consumption during the first days above 75% (lower-left chart). We will monitor the system during the following months and publish a follow-up report. Follow us on Twitter or on Facebook for further updates tagged #TeslaPowerwall.